Case I: When the centre of the circle is known. Construction 3: Draw two tangents to a circle (whose diameter is 6 cm) from a point P at a distance 9 cm from its centre. Also measure the length of two tangents. 1. Draw a circle with centre O and whose radius is 3 cm. 2. Take a point P at a distance 9 cm from the centre O. 3. Join O with P i.e., OP = 9 cm. 4. Bisect OP at C or draw the right bisector of OP. 5. With C as centre and radius PC or OC describe another circle cutting the given circle at T and T.
6. Join PT and PT. 7. 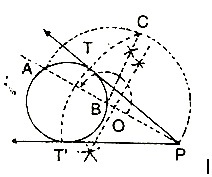 PT and PT are required tangents drawn from a point P to the given circle. Case II: When the centre of the circle is not known. Construction 4: Draw a circle of radius 2 cm and construct tangents to it from an external point P without using the centre. 1. Draw a circle with radius 2 cm. 2. Through the external point P draw a secant PBA meeting the circle at A and B. 3. Bisect AP at O or draw the right bisector of AP. 4. 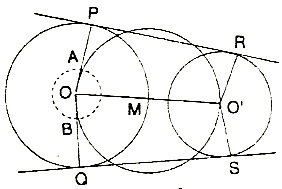 Draw a semi-circle described on AP as diameter. 5. Through B draw BC ^ AP meeting the semi-circle at C.
6. With centre P and radius PC draw an arc cutting the given circle at T and T.
7. Join PT and PT' which are the required tangents. Construction 5: Construct a circle of radius 3 cm and take a point P at a distance of 7.5 cm from its centre. From it, construct tangents to the circle without using its centre. 1. Draw a circle with centre O with radius 3 cm and P is a point at a distance 7.5 cm from O. 2. Draw a secant through P intersect the circle at A and B. 3. Produce AP to a point C such that PA = PC. 4. With BC as diameter, draw a semi­ circle. 5. At P, construct a perpendicular to BC to intersect the semi-circle at D.
6. With P as centre and PD as radius, draw an arc to intersect the given circle at T and T.
7. Join PT and PT. 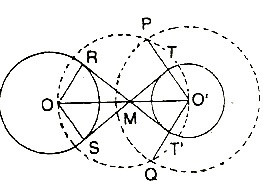 Then, PT and PT are the two required tangents from the point P to the given circle. Expertsmind.com offers help with External Circle assignment and homework in mathematics subject. Experts mind’s math experts are highly qualified and experienced and they can solve your complex External Circle math problems within quick time. We offer email based assignment help –homework help service in all math topics including External Circle .